A monthly selection of fruit, veg or flowers that flourish on the Warriston site. Two Warriston plot holders give us the low down on blueberries. Another west side plot holder says: “We've all heard that blueberries are a so-called 'super food', and supermarket prices often reflect this, with a small punnet costing upward of £3. However, just like many other soft fruits and berries, blueberries thrive in our cool, wet Scottish climate—so if you can find a suitable permanent spot on your allotment, they're well worth growing. ‘Chandler’ is a mid/late season variety that produces very large berries with a slightly flattened shape—sometimes as big a 10p piece! Here's some blueberry facts below. Description: A perennial fruit bush with attractive bell shaped flowers and fruit that ripens between June and September (depending on variety), blueberry bushes are hardy and should have no problem coping with the average Scottish winter. Once established, (sometimes a few years), plants should provide good harvests for many years to come. 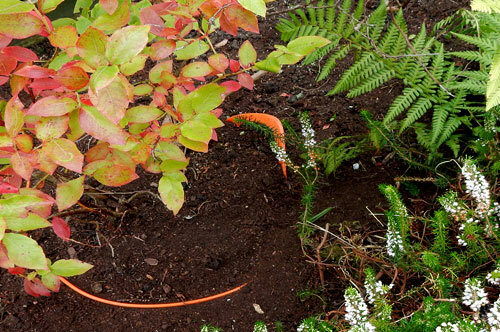 Planting: Blueberry bushes are usually bought as young plants in late winter. As they're ‘acid loving’ plants, they'll need to be grown in ericaceous compost—for this reason they're often grown on in pots or raised beds where soil acidity can be controlled. They also prefer to be watered with rainwater, rather than tap. Other than that, place them in a sunny spot and they should do well. Many blueberry varieties are self fertile, but for maximum crops it's always recommended to grow at least two in close proximity. Fully grown bushes can reach 1.5 metres high and wide, so space accordingly. Pests: Blueberries don't suffer from the usual array of allotment pests, although blackbirds might take a fancy to your crop, so net if you're not willing to share. ​Eating: Eaten fresh or added to cakes, muffins etc, blueberries are delicious and nutritious, and have been found to have various health benefits including maintaining healthy bones, lowering blood pressure, and managing diabetes.